Ingri Fiksdal, "STATE." Photo: Anders Linden. Costume design by Henrik Vibskov. STATE, the performance by Norwegian choreographer Ingri Fiksdal, director Jonas Correll Peterson, and Copenhagen-based fashion designer Henrik Vibskov at the Museum of Contemporary Art Chicago was recently highlighted in Newcity. 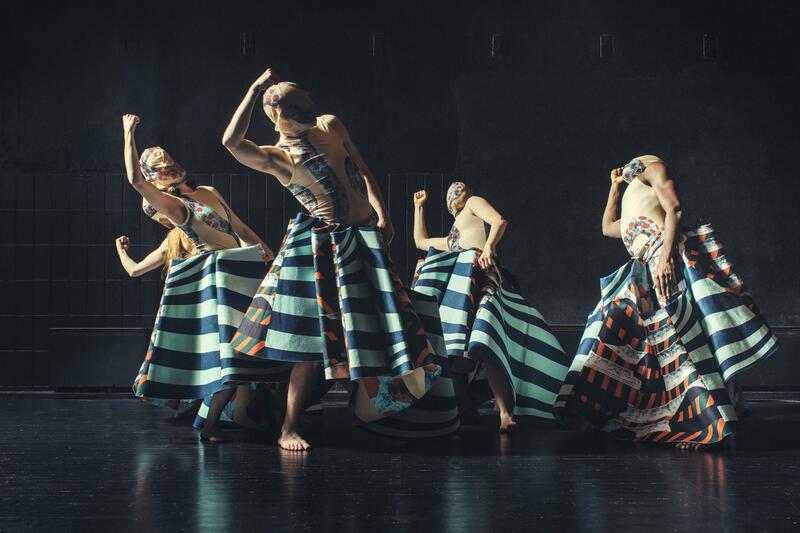 STATE, which runs from February 7–10, "imagines a small society of five dancers, manifested through inventive costumes, live music and ritualistic dance," reports Newcity. Newcity also highlighted Fiksdal's free outdoor performance, Diorama, which takes place at Cloud Gate in Millennium Park from February 11–13. For this performance, students from SAIC's MFA program will perform with Fiksdal's dancers in sequined outfits designed by fashion designer Fredrik Floen. "Timed in tandem with the winter sunset, the performance reflects on the passing of time and our shifting perspective of the urban landscape," says Newcity. SAIC's Sullivan Galleries is hosting a suite of events around the work of Fiksdal, Vibskov, and Floen. Events include an artist talk with Fiksdal, a multimedia exhibtion titled Henrik Vibskov : 0000 : State on State, and an installation by Floen among other events.